In our society, where medical testing can be done to assure that only children without defects are born, those who are born with handicaps are often regarded as “tragic” oversights. In this light, the “unwanted” of the world have a patron saint in a medieval woman who was born a crippled, blind and hunchbacked dwarf. Bl. Margaret of Castello was born in the fourteenth century in Metola, Italy to noble parents who wanted a son. When the news was brought to the new mother that her newborn daughter was a blind, hunchbacked dwarf, both parents were horrified. Little Margaret was kept in a secluded section of the family castle in the hopes that her existence would be kept secret. However, when she was about six years old, she accidentally made her presence known to a guest. Determined to keep her out of the public eye, her father had a room without a door built onto the side of the parish church and walled Margaret inside this room. Here she lived until she was sixteen, never being allowed to come out. Her food and other necessities were passed in to her through a window. Another window into the church allowed her to hear Mass and receive Holy Communion. The parish priest became a good friend, and took upon himself the duty to educate her. He was amazed at her docility and the depth of her spiritual wisdom. When Margaret was sixteen years old, her parents heard of a shrine in Citta di Castello, Italy, where many sick people were cured. They made a pilgrimage to the shrine so that she could pray for healing. However, Margaret, open to the will of God, was not healed that day, or the next, so her parents callously abandoned her in the streets of the town and left for home, never to see her again. At the mercy of the passersby, Margaret had to beg her food and eventually sought shelter with some Dominican nuns. W. R. Bonniwell writes, “Her cheerfulness, based on her trust in God’s love and goodness, was extraordinary. She became a Dominican tertiary and devoted herself to tending the sick and the dying” as well as prisoners in the city jail. How does Margaret’s story apply to our times? Her parents wanted a boy, and if not a boy, at least a perfect girl. In the eyes of the world, she was useless, and what right do useless people have to live? Bl. Margaret helped innumerable others by her life and her good deeds, finding holiness by uniting her sufferings to Christ’s. And now, some 670 years after her death, she teaches us valuable lessons by her very being. Deprived of all human companionship, Margaret learned to embrace her Lord in solitude. Instead of becoming bitter, she forgave her parents for their ill treatment of her and treated others as well as she could. Her cheerfulness stemmed from her conviction that God loves each person infinitely, for He has made each person in His own image and likeness. This same cheerfulness won the hearts of the poor of Castello, and they took her into their homes for as long as their purses could afford. She passed from house to house in this way, “a homeless beggar being practically adopted by the poor of a city” (Bonniwell, 1955). Bl. Margaret died on April 13, 1320 at the age of 33. 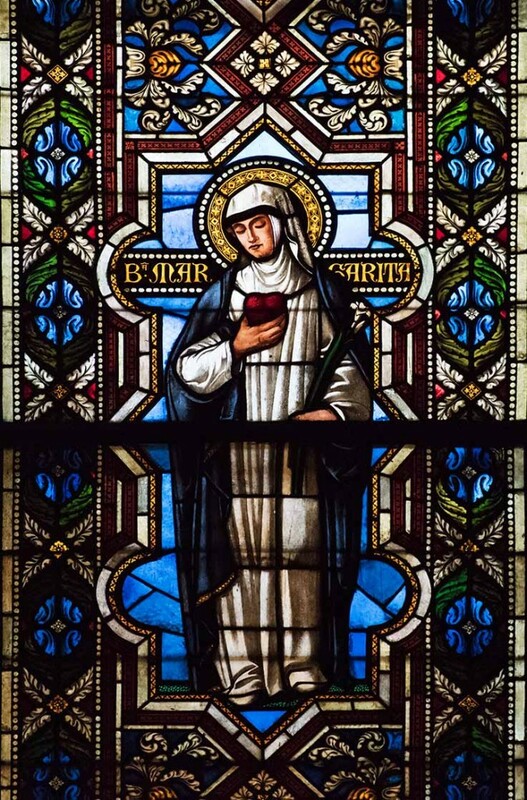 More than 200 miracles have been credited to her intercession since her death. She was beatified in 1609. Thus, the daughter that nobody wanted is now one of the glories of the Church.